Cost : US$ 100 - Rs. 2000/- + Rs. 150/- towards postage/courier charges. Processed Food Products Suppliers & Exporters. Snack Foods Suppliers & Exporters. 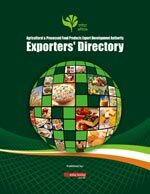 Meat, Poultry, Fisheries & Marine Products Suppliers. Milk & Other Dairy Products. Rice - Basmati & Non-basmati and Cereals Products. Food Processing Machineries & Equipment Suppliers. Allied Industries & Service Sectors like Additives, Chemicals, Banks & Financial Institutions, Brokers, Consultants, Freight Forwarders & Transporters, Laboratories & Lab. Instruments Suppliers, Plants, Machineries and Other Input Suppliers, Surveyors & Analysts Advertisers Index etc. Cost : US$ 80 - Rs. 600/- + Rs. 150/- towards postage/courier charges..
Horticulture Dept. / Govt. Agencies Pots, Hanging & Other Gardening Accessories Supp. Cost : US$ 80 - Rs. 1500/- + Rs. 150/- towards postage/courier charges.